1. Ignore the Advice of 99.99851% of the Planet: Hrisko has a great point here. There are over 6.6 billion people on the earth that have not made a million dollars and a lot of those people try and give advice on how to get there. You should take the advice of the people who are there... people who have done it. It is wise to find a good mentor that fits into the million-dollar category, so you can sponge up their wisdom. This point illustrates why I do this blog the way I do... Many people have suggested that I don't write about books, but give my own predictions and advise based on what I know. Well... I don't know much more than what I can be taught. I am just starting my life and I would be lying if I tried to pass off the information I receive as my own. 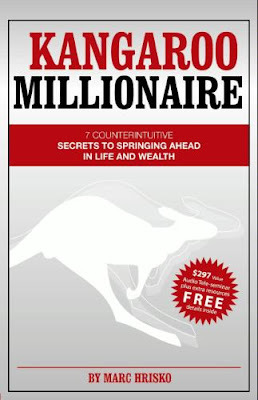 The authors I review are the millionaires/amazing leaders and I am merely the middleman between you and their wisdom. You get Courtesy Checks from your credit card companies in the mail several times a year. Normally, people just discard these. Save them. They cost nothing to use and have incredible potential if you plan correctly. 2. Write a Check From Card A, for as much as your limit, (After you have increased your credit limit as high as you can, just call and ask) to yourself and deposit it into your checking account and pay for the down-payment of your investment. 3. Before Card A's due date, write yourself another courtesy check from Card B and deposit in your checking account. 4. Use the money deposited in your account from Courtesy Check from Card B and pay off Card A's Balance. 5. Do this as many times as necessary to have free capital raised. I advise you to have a plan of return on investment that will surpass the amount of capital you have "raised." It's obvious, but I don't want anyone to think this a great idea and go buy a big screen TV and see how long they can go without paying for it. That's just dumb. 3. Be the Stupidest Person in the Room: The smartest people in the world are not the richest people in the world. "If IQ equaled riches, Albert Einstein would have been the world's richest man. He wasn't." The trick to riches is surrounding yourself with the smartest people you know and using their knowledge. Marc Hrisko contends that any person with average intelligence, armed with the right education and a Kangaroo mentoring their path can be a millionaire within 2 to 3 years. Use the knowledge of those around you and rocket yourself to riches. The old saying used to be "If you want something done right, do it yourself"... That's not a smart saying.... "If you want something right, have the right person do it"... That seems a little more reasonable. To think that you are the best at everything you do is arrogant and ignorant. Use your team, and analyze each person's skill sets to best serve your purposes. 4. Be Lazy: I got to say... I don't like the name of this chapter, but the message is good. The idea is not to do more than you have to. There is no reason to micromanage everyone around you or do things that aren't worth the time. If you monetize your life and worth, you may find that an hour of your time is worth X. If you don't like cleaning your house than get quotes for the cost. If the price of cleaning is Y, then you subtract X by Y and you have the real cost or the savings for you. Monetize your worth: If one of your income generators you could be working on instead of cleaning is finding, buying, and renting out multi-family properties. 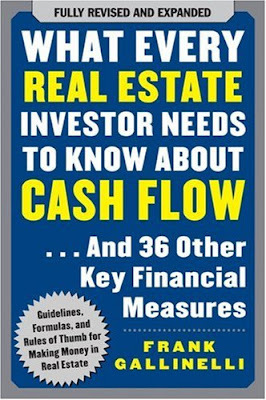 The profit you realize from the average property divided by the time it takes from start to finish is what you could be making. Add that to the hourly net income you receive from your main career. You might find that you are worth $30+ an hour in an 18 hour day and to hire a housekeeper will cost $25 an hour. This means that if you do it yourself (and you don't find it enjoyable) then you are LOSING $5 by not outsourcing. So it seems like a no-brainer. Also on the subject of being lazy, Hrisko points out the same phenomenon that Tim Ferriss did in 4-hour Work Week... Crises don't happen often, if ever. People don't need to get a hold of you all hours of everyday. Teach your team to fish, meaning teach them to solve problems for themselves and you will free up the phone time they might consider a crisis phone call. You'll have more time to do other things that YOU need to get done. 5. Pay Higher Prices: You get what you pay for. If you go with the lowest bidder, in most situations you will get the lowest quality. If you never go with the lowest bidder than you solve that problem. The time wasted on fixing problems created by the lowest bidder are not ever worth it. Usually these lowest bidders will cost you more money and time in the long run than you ever thought possible. For example: if you have the lowest bidder come out and fix your car he may just wrap the engine in duck tape and in one more week you will have way more of a problem. Higher prices also correlate in a social arena. If you are looking for a club or activity you should want to join the more expensive and more elite club. This will put you in contact with the highest achievers. And as we learned earlier, surrounding yourself with the best of the best is a great way to rocket yourself to riches. 7. Give Stuff Away: "We make a living by what we get. We make a life by what we give"- Winston Churchill. It is very important to donate your time, treasures, and talents. Besides it being the right thing to do, it comes full circle. You get what you give. As Hrisko writes, generosity is like a boomerang. Additionally, when you are known for being a generous person, people are more inclined to work with you. If you are known for a scrooge or a miser with your money than people are careful in their dealings with you, less inclined to trust and deal with you for fear of being "taken." This book is full of resources and I would be remiss if I didn't share them with you... please look at each one, they are worth the glance. I wouldn't take the time linking them if I didn't feel strongly about this. This was a great book and I wouldn't be surprised to see it on "The List" in the near future. I look forward to hearing more from Marc Hrisko. He has a great story and he is a good writer.If you have any questions on the book don't hesitate to ask. I would be more than happy to help anyone that wants it. 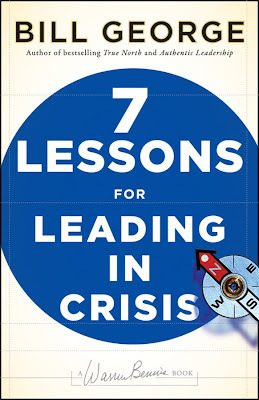 The book of the week was 7 Lessons For Leading in a Crisis by Bill George. I have a lot of appreciation for this book. I feel that a 'crisis' is a relative term. A lot of young professionals have 'crises' early in their career and what they consider a crisis early in their career is nothing more than a hiccup later on. And the way young professionals handle crises early in their career set the stage for the rest of their life. #1 Face Reality, Starting with Yourself: This is all about realizing what is going on within the organization around you. Actually seeing the crisis is step one. It is too easy to ignore a serious issue or just gloss over it. Once you recognize that there is a crisis, you then need to establish your responsibility within it. Too few leaders are capable of accepting responsibility for their actions. #2 Don't Be Atlas, Get the World Off Your Shoulders: Great leaders surround themselves with the "right" people. Assuming that you have an amazing team of skilled leaders around you, use them. There is no reason to do everything yourself. You will bury yourself instead of solving the problem. Target's current CEO, Gregg Steinhafel, turned inward shortly after succeeding Bob Ulrich in 2008. Steinhafel was seeing increasing losses in the Target portfolio after Ulrich had multiplied the stock price 10 times, from $5.48 to $54.00 and bested Wal-mart for forty-four months straight. Steinhafel was tired of the pressures put on him by activist investor William Ackerman and turned inward for support. Ackerman started a proxy fight trying to replace the board with his own slate and because of Stienhafel's turning inward, Ackerman lost the proxy contest, with Stienhafel garnering over 70% of shareholder's votes. Since the feud, Target has been back on top. #3 Dig Deep for the Root Cause: When someone is handling a crisis it's easy to find a temporary fix. A leaky boat's patch will only hold for so long and the leak will be back and worse than before. People have to make hard choices in crisis, but upon making them you can take the reigns of the organization and come back stronger than ever. #4 Get Ready for the Long Haul: Often leaders will be short-sighted and think the problem is smaller than it is. Analyze the situation and determine the length you will be dealing with. A perfect example of this done wrong is when President George W. Bush declared victory with the war in Iraq in 2003 on the aircraft carrier Lincoln with a giant sign that read "Mission Accomplished." When a leader declares victory too soon in a crisis, it destroys credibility and makes it very difficult to foster good relations and rally support to solve the problem effectively. #5 Never Waste a Good Crisis: A crisis is your opportunity to change an organization, top to bottom. Use the opportunity to get transformative affect. This can be seen in the current economic climate. When the nation is in a time of progress, it will grows rapidly, spending and staffing expand very rapidly within organizations. Then when a down-turn hits, the organization moves into a time of slow growth or decline. This is seen as a crisis to most organizations and gives time to reflect tightening spending policies and lay-off the least-performing individuals. If companies waste a crisis,and doesn't do a complete spending and staffing over-haul they will sink their organization or worst yet, fail. #6 You're in the Spotlight: Follow True North: As a leader in a crisis, everyone will be looking at you for direction. Integrity counts for a lot in these crises. People will be watching everything you do and emulate it because, after all, you are their leader. Be cautious of what you do and what you say because regardless of whether you think someone is watching or listening, they are. Being truthful and honest in every approach will trickle down the organization. #7 Go on the Offense, Focus on Winning Now: A crisis is a wonderful time to gain a competitive edge. Again with the example of the current recession, while most companies are in hibernation, there are a select few that saved for this day and have expanded. Everything is at a discount. You can acquire your competition for pennies on the dollar. Reshaping of markets always happens in economic downturn and you can either hunker down and hope for the best or maintain a laser-like focus to lead the reshaping according to your terms. I prefer the latter. A crisis has a silver lining, as I hope I have shown you. I want to bring very close attention to this subject for all the young professionals out there. When you are establishing yourself within an organization you will encounter many "crises" early in you career. You have choices with each one of these crises. I prefer you choose to use the choice that encompasses your integrity. If you truly want to get ahead within an organization you will need to be ethical in everything you do. It is very easy to cut corners in a crisis, but doing this will only create a short-term fix and you will not do what is right for the organization or for your professional career. You will be evaluated in everything you do early in your career, by your team and by your leaders, if you want to stand out do it with integrity. 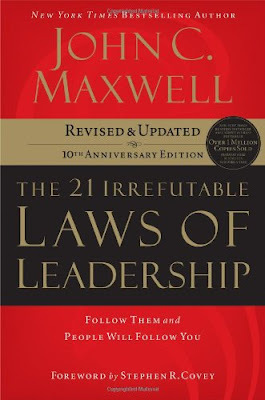 This book is interesting, it uses several cases from top organizations and leaders. I picked it up randomly and I am very glad I did. It gave me a lot to reflect on that I plan to use in my personal life. I don't doubt that it would be beneficial to you too. If you have any questions on the book don't hesitate to ask. I would be more than happy to help anyone that wants it.